US Secretary of State John Kerry has hailed China for being “very serious” about a pledge to help resolve tensions over North Korea’s nuclear programme. The US and China earlier said they were committed to the “denuclearization” of the Korean peninsula. John Kerry said the two sides would hold further meetings “to bear down very quickly” on how to achieve that goal. North Korea has recently threatened attacks against South Korea and the US, amid a flurry of bellicose statements. Speculation has also built that the North was preparing a missile launch, following reports that it had moved at least two Musudan ballistic missiles to its east coast. John Kerry has said any such launch would be a “huge mistake”. After a day of meetings in Beijing with President Xi Jinping and other top Chinese officials on Saturday, he said both governments called on North Korea “to refrain from any provocative steps and that obviously refers to any future missile shoot”. John Kerry, who is on a four-day tour of Asia, continues to Japan on Sunday. 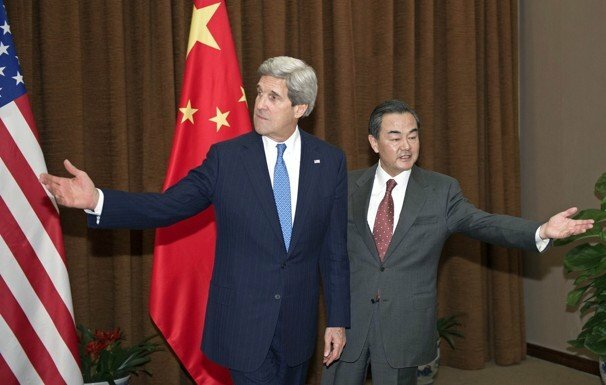 Following John Kerry’s meetings, China’s top diplomat Yang Jiechi said his country’s position was “clear cut”. “China is firmly committed to upholding peace and stability and advancing the denuclearization process on the Korean peninsula,” he said, adding that the issue should be resolved “peacefully through dialogue”. No specifics were given, though John Kerry said the two sides would hold “further discussions to bear down very quickly with great specificity on exactly how we will accomplish this goal”. He later told reporters that the US Chairman of the Joint Chiefs of Staff, Martin Dempsey, would visit Beijing later this month accompanied by intelligence officials. China is North Korea’s only ally and major trading partner, but has grown increasingly frustrated with its growing belligerence. However, persuading China to increase the pressure on North Korea will not be easy. China is still North Korea’s lifeline, and Beijing is unlikely to cut vital supplies of food and fuel since it feels that may make the North even more desperate and unpredictable. On Saturday John Kerry raised the prospect that if North Korea stopped its nuclear programme – “if the threat disappears” – then the US would no longer have “the same imperative… to have that kind of robust, forward-leaning posture”. Since the UN imposed fresh sanctions on North Korea in February in response to its third nuclear test, Pyongyang has promised to restart a mothballed nuclear reactor and threatened a nuclear strike against the US mainland. It has also shut an emergency military hotline to South Korea, and urged diplomatic staff to leave, saying it cannot guarantee their safety. North Korea says it has also been angered by joint US-South Korean military exercises. On Saturday, a commentary piece on Chinese state news agency Xinhua said Washington had itself “been fanning the flames” by sending military reinforcements to the region. But during his trip, John Kerry has stressed that the US has tried to tone down its own statements, and cancelled some military exercises in an effort to defuse tension. Though North Korea’s rhetoric has been more bellicose than usual, analysts say it fits a long-standing pattern, and may be intended to boost the popularity of Kim Jong-un, who came to power last year.